In RoboCup 2016 in Leipzig, Germany, the team CIT Brains from the Chiba Institute of Technology (CIT) achieved excellent results. The team won first place in the KidSize technical challenges of the humanoid league, achieving the remarkable feat of the fifth successive victory in the international competition’s technical challenges. In the KidSize soccer 4 on 4, the team was unfortunately defeated in a semifinal heat and ended up in third place. In the AdultSize technical challenges, the team finished in third place, while the team came in second place in the vote for the best humanoid robot, regardless of size. - First of all, let me give you my congratulations on your remarkable feat last year! 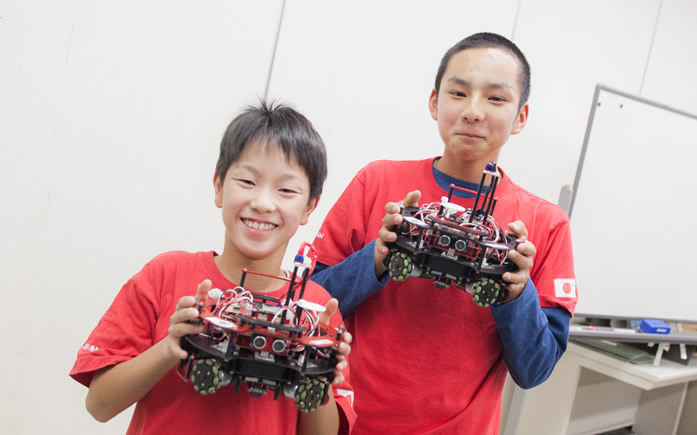 You earned your fifth successive victory in the KidSize technical challenges in the RoboCup! Thank you very much. Although we finished the KidSize technical challenges in first place, we were defeated in the other categories. So, we’ll try even harder to win a victory in each category in which we compete this year. 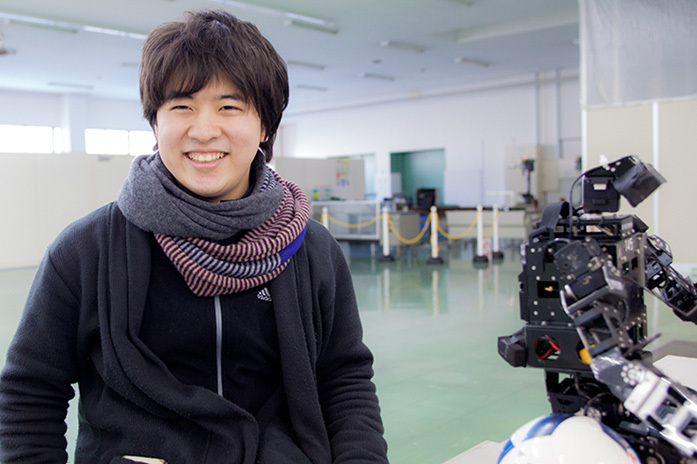 Mr. Seki, who became a senior in April 2017, participated in RoboCups 2015 in China, and 2016 in Germany. 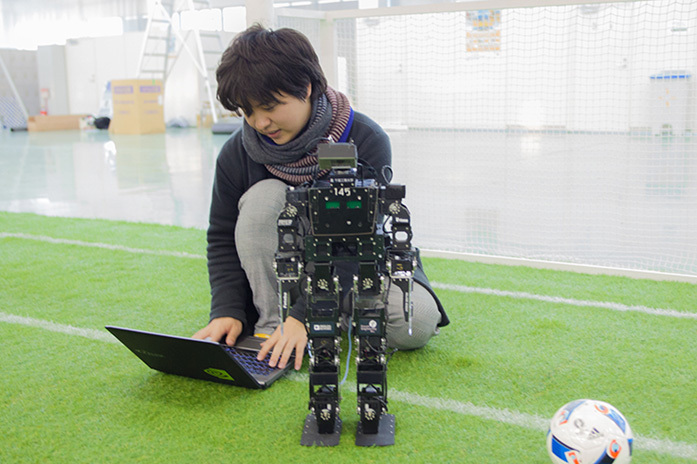 The CIT Brains has competed for the recent few years in the KidSize (robot height: 40–90 cm) and the AdultSize (130–180 cm) tournaments of the RoboCup soccer humanoid league. 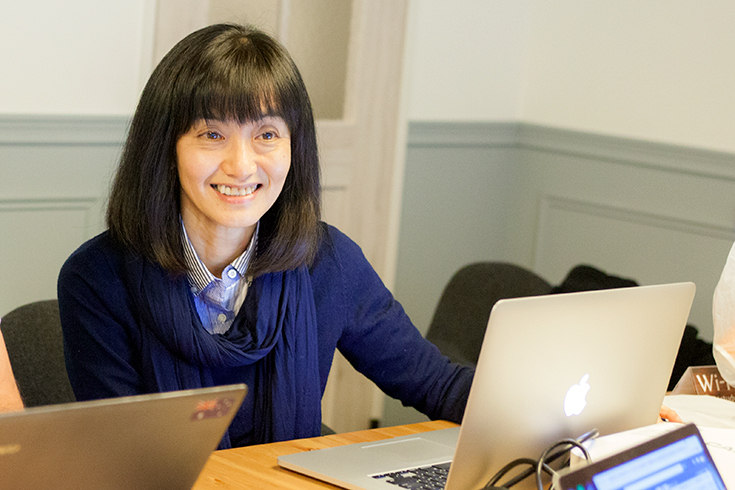 While some 12 members of the team are involved in the KidSize team, six are engaged in the AdultSize team. 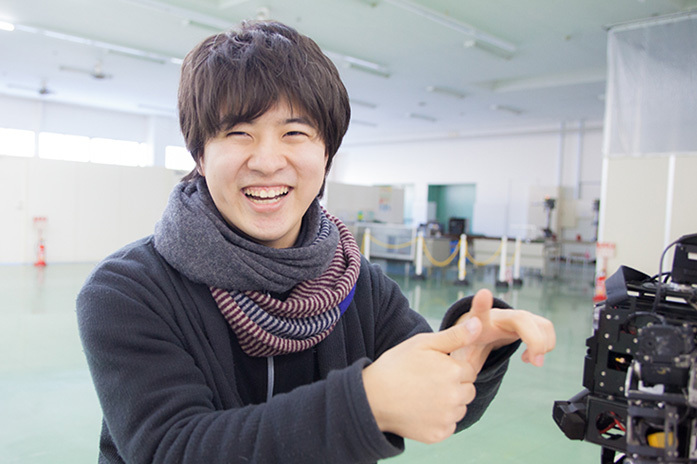 Mr. Seki works mainly with the KidSize team on technical aspects. In the KidSize tournament, a game is held four on four, with one team comprising four robots. The CIT Brains has seven robots, including reserve machines. In the AdultSize tournament, although a penalty shoot-out was held until last year, it will be replaced with a one-on-one game from this year. 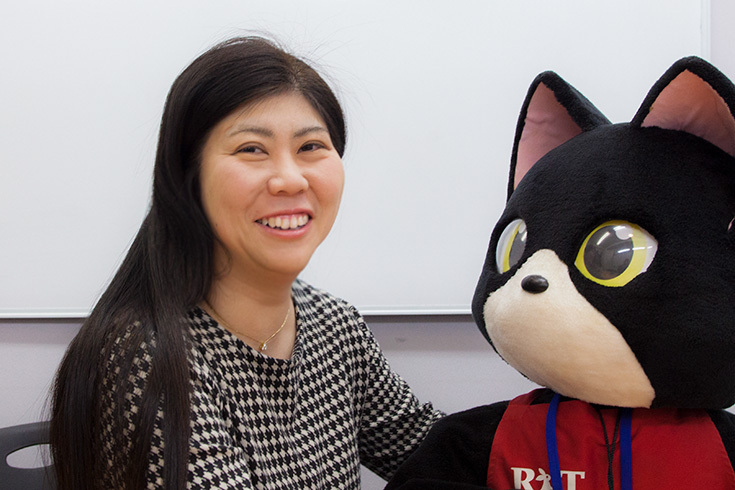 However, since the number of necessary robots will remain one, fewer members are engaged in the AdultSize team than the KidSize team. 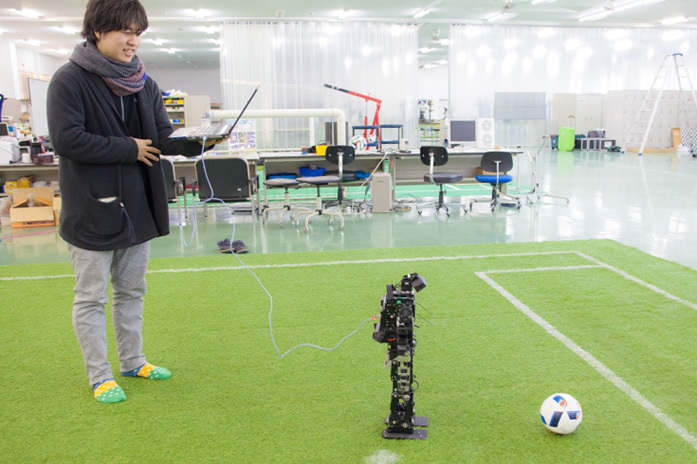 Held according to robot size, technical challenges are separate from four on four or other types of soccer games where robots compete to score goals. In technical challenges, each robot demonstrates technically high-level actions, such as making a loop shoot, dribbling a ball quickly, or making a high jump, which are scored by judges. - In the previous event, you were in charge of the KidSize team, but unfortunately, your team was defeated in a semifinal heat, wasn’t it? Yes. The game (20 minutes in total with each half running for 10 minutes) was locked at 0-0, and went into extra time with each half running for five minutes. However, since neither of the teams was able to score a goal even in extra time, a penalty shoot-out was held, and we were unfortunately defeated by one goal. - Your team achieved victory in the KidSize technical challenges, and this means that your team’s robots had high potential, doesn’t it? Nevertheless, the team was defeated in the game. Do you feel that in order to win games, you need something other than technical excellence? I feel so. For example, you need to think about stamina and pacing in order to make it until the end of a 20-minute game. - Are there any differences in the world of robots, like that between marathon running and sprinting in human athletics? In terms of pacing and fatigue, robots are similar to humans. If you operate a robot for a long time, heat accumulates in the motors that sustain the robot. If there is “fatigue” in the motors, I mean, if the motors don’t work properly, the robot no longer moves sharply and doesn’t demonstrate its expected power. For example, if there is fatigue in the motor of one of the robot’s legs, the robot can no longer walk straight. If it falls down, it can’t stand up. 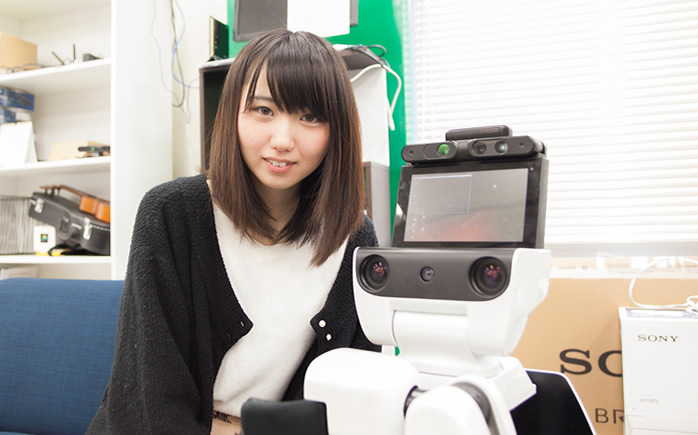 So it’s more difficult than expected to prepare a robot that can continue to demonstrate high performance until the end of a game. - Do you mean that to prevent such fatigue, you need to program a robot to move at a slower pace? It’s certainly important to decrease the pace, but when you operate a robot, the important thing is to control the robot so that it does not move unnecessarily. For example, if one of the robots in your team moves toward the ball, the remaining three robots need to take appropriate positions (make an appropriate formation) without taking unnecessary action. For design, weight distribution is important, and you need to ensure that the robot has its center of the gravity exactly in its center. If there is any difference in weight between the two sides, an excessive load will be placed on the motor on one side, leading to a decline in the robot’s durability. - I think it’s great that autonomous robots move based on their own judgement in terms of pacing and position, rather than being radio-controlled by humans. By the way, I guess there are differences in quality between motors, even if they are the same model. That’s true. We sometimes encounter a motor that demonstrates very high performance, enabling the robot with the motor to move very sharply. We call such a robot an “ace striker” (laughs). Although we replace a motor with a new one immediately before a world competition, the reality is that the motor’s performance sometimes varies depending on the day. So, we select robots that work well on the day and use them for the competition. During the games, the motors’ performances change, due to the robots’ falling over, the motor fatigue, and other factors. 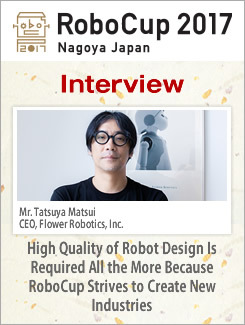 - Now that you have competed in the RoboCup for two years, what do you think about the competition? 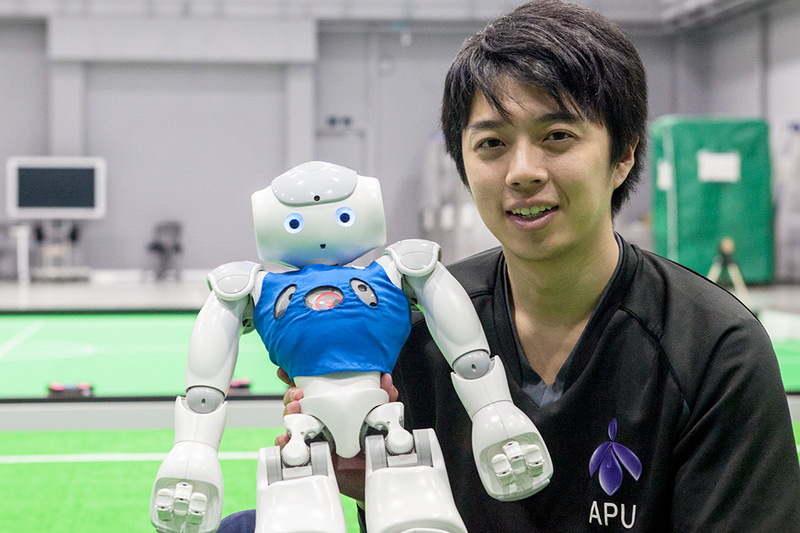 Since RoboCup is a competition not only for students, but also for researchers and developers, it attracts many strong teams from around the world. I feel that accordingly, it serves not only as an open, academic and technical competition, but also as an opportunity for participants to demonstrate their cutting-edge technologies against rival teams, stimulating their motivation to win. Partly because robots are gaining considerable public attention today, the competition is widely covered by the media and often broadcast, further intensifying the motivation of the teams from different countries. - Do you feel any annual progress in robot technologies? In the humanoid league, we used to compete in terms of how to make the robots approach the ball quickly, but recently, we’ve also been considering strategic and tactical elements, such as pacing and timing to change robots. Some CIT professors also say that rapid progress has been made over the last few years. From a technical perspective, it is incredible enough that humanoid robots can walk stably on two legs. To dribble the ball in a soccer game while jostling with opponents and to kick the ball toward the goal are, of course, far more difficult. Although it is not yet possible for such robots to demonstrate super skills like human players, their performance entails higher-level technologies than expected. This year, the CIT Brains will introduce deep learning, an artificial intelligence (neural network) technology drawing considerable attention today. 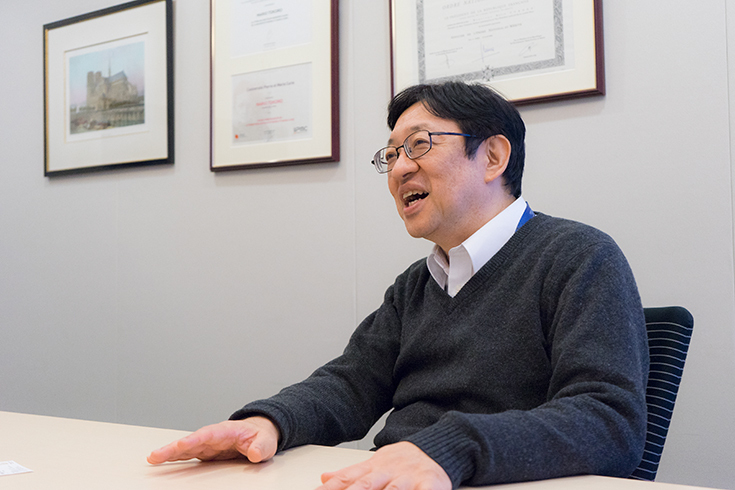 For the interview, Mr. Seki brought the KidSize robot Accelite, which is equipped with NVIDIA’s Jetson TX1 as the AI computer board for a deep neural network. Accelite, a RoboCup robot developed by the CIT Brains team. Carbon, being lightweight and durable, is mainly used for its body. 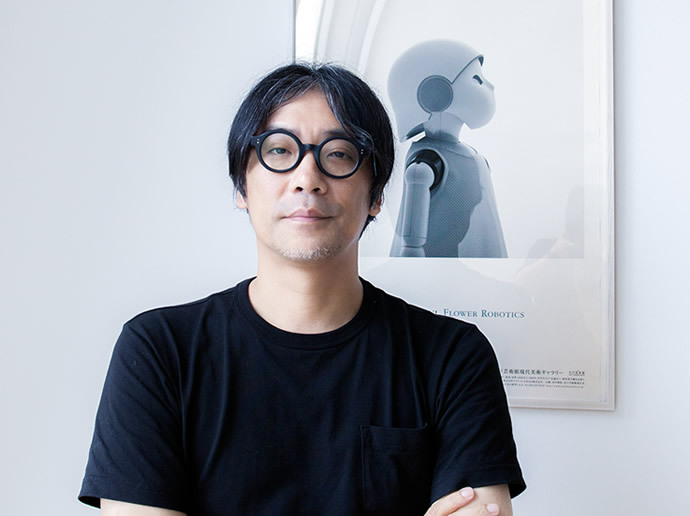 The robot is equipped with an AI computer board. - Do you have a special impression of the past two events in which you have competed? For RoboCup 2015, China, some of the regulations were revised considerably, causing us both joy and difficulties. One of the changes was the introduction of artificial turfs for the pitch, instead of carpets. Bipedal locomotion is affected by turf length and direction. As a result, compared with the time when carpets were used, it is now more difficult for robots to walk or kick stably. Previously, many robots had flat soles, but today, robots with such soles are more likely to slip depending on the turf direction, with the load gradually shifting backward. The CIT Brains was aware of this point ahead of the other teams. Our original plan was to set a plate tilted upward in order to prevent the ball from coming onto the edge of a robot’s foot during a game, but we set the plate downward. Consequently, the stability was increased, and the contact with the pitch and balance were also improved. Since then, many teams have begun to design robots with spikes or hobnails on their soles (laughs). Accelite’s soles. 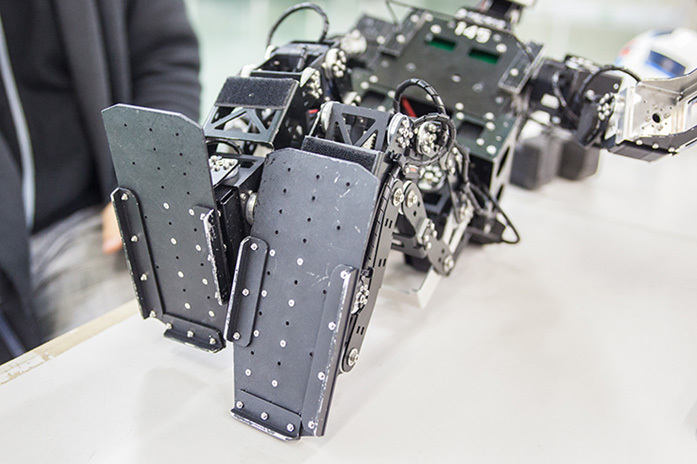 In RoboCup China, the CIT Brains flexibly set the plate downward to prevent the robot from losing its balance and slipping on artificial turfs. 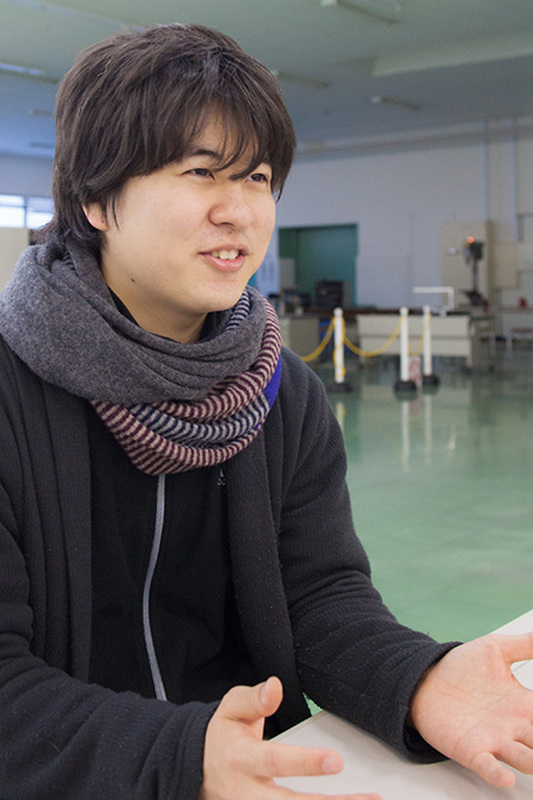 He says that the awareness of various points is important in the RoboCup. Another big change was the ball design. Since an orange-colored ball had been used for the previous competitions, many robots were designed to detect the color orange to recognize and follow the ball. From that year, however, a ball with white as its base color—like those used in soccer games played by humans—was adopted, requiring vision technologies so that the robots could recognize the ball itself to follow it. 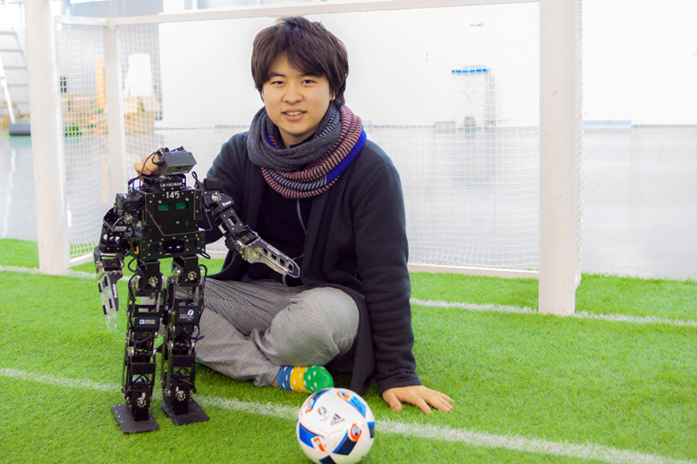 In this regard, Mr. Seki’s team also began to conduct research on technologies that would enable their robots to recognize and follow the ball without losing sight of it by machine learning through deep learning. 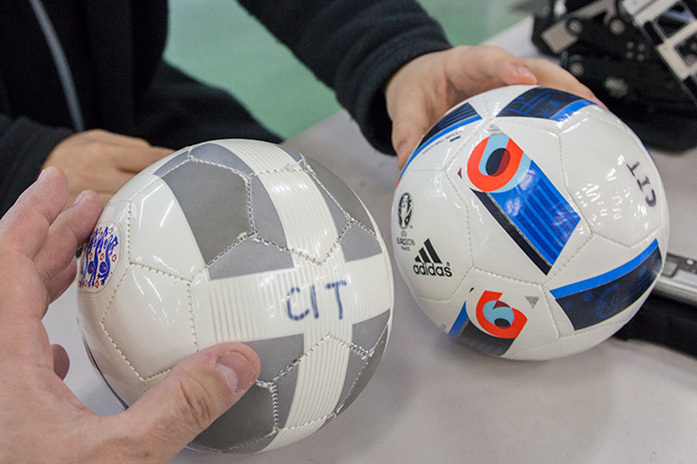 Balls used in RoboCup China (left) and RoboCup Germany (right). White is used as the base color, making it difficult for robots to recognize the white color of the ball from the white color of the pitch lines and goals. - What measures did you take? For this robot, we’ve introduced a deep learning system. I once heard that deep learning is effective in image classification, so I wanted to try it for robots. When we competed in the last year’s event, we introduced it partially, but it was still a very simple classification system. Far from enabling the robots to recognize the ball, the system only helped the robots to classify images and judge whether or not what they regarded as a ball was really a ball. We simply used it as a supplementary system. The robots were often at a loss when following the ball, and we couldn’t produce satisfactory results at all. 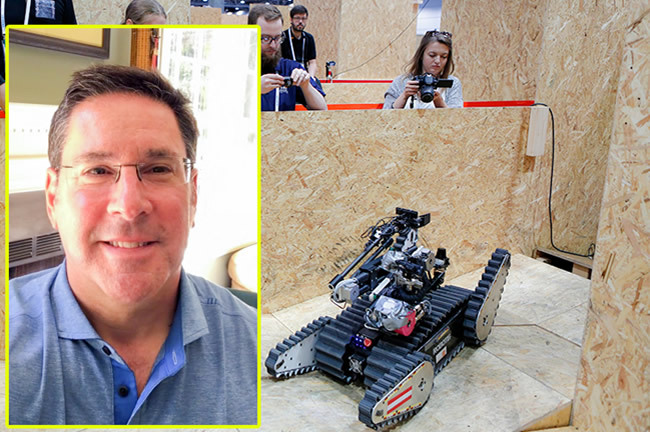 - After RoboCup Germany, you learned that an AI computer board mounted with a GPU is effective as a form of computer vision (robot vision) technology, and you’ve begun to use it, right? That’s right. By learning through many ball images using deep learning, our robots have become able to recognize the ball. The new system enables robots not to perform image classification, but to actually detect the ball. Since the system generates the desired results, we’ll equip our robots with the system from this year’s competition. - - Deep learning is often referred to as one of the AI-related neural network technologies. Do you feel that it is quite different from the previous ball recognition technologies? Yes, though we’re still inspecting the system. When a robot looks back, its visionary image becomes blurred and obscure, but even with such an image, the system makes it easy for the robot to find the ball accurately, and I feel that this is a strong point. Since vision technologies are extremely important for soccer games, research on deep learning might become one of the key points for this year’s event. In last year’s competition, the robots struggled with the difficulty of recognizing the ball when it was on a white line or in front of a goal, but deep learning has played a considerable role in solving this problem. Deep learning can work as an effective vision technology, but it is more difficult than expected to recognize opponent robots, because in order to remember opponent robots through machine learning, many photographs of them are needed. Photographs of CIT robots are readily available, but such items are useful only for recognizing existing teammate robots. There is no knowing how effective deep learning is when it is used to recognize opponent robots with quite different designs. Although deep learning is attracting considerable attention as an AI-related technology, this might be a clear example showing how difficult it is to increase accuracy without preparing a huge amount of data beforehand. - Is there any considerable improvement made in Accelite over the past few years, other than the vision aspect? Up until two years ago, Accelite was not designed to bend its arms. Placing the priority on lightweight, the robot did not have motors in its elbows. When it tried to get up after falling down, the robot used its arms. In the previous design, Accelite would get caught on the pitch with its arms extended, often preventing it from getting up. So, we’ve added a motor system. Although this has resulted in increasing its weight, we’ve redesigned the robot so that it could bend its elbows and then extend them when getting up, dramatically increasing its speed of getting up. However, not only the speed, but also the weight was also increased, and this might have led to the failure of the robot to maintain its full power until the end of the penalty shoot-out in last year’s semifinal heat, though I can’t say for sure. 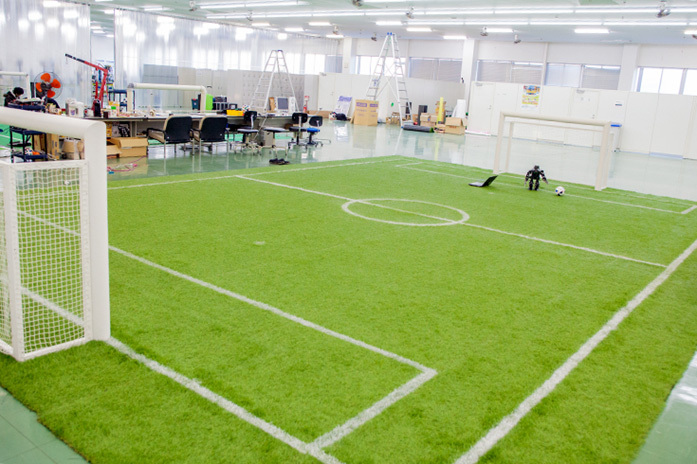 At the Chiba Institute of Technology, there is a permanent soccer pitch for robots in a spacious working area in a reconstructed warehouse. 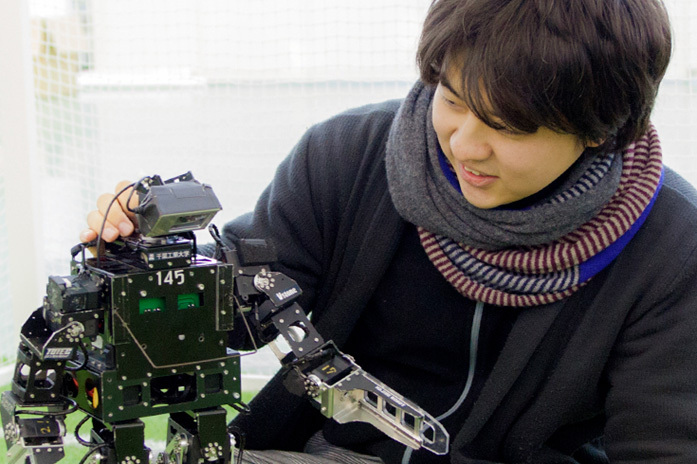 - Do you feel any specific progress in robots that participate in the RoboCup? I feel that there is outstanding progress in AI, or intelligence in general. Unlike in the small league, there are few teams that consider detailed team formations and devise strategies. However, our team designs artificial intelligence to ensure communications between our robots so that they can move as either an attacker or a defender. For example, if one robot catches the ball, another robot participates in the offensive as an attacker, while the remaining two robots play as defenders. I also feel changes in hardware. 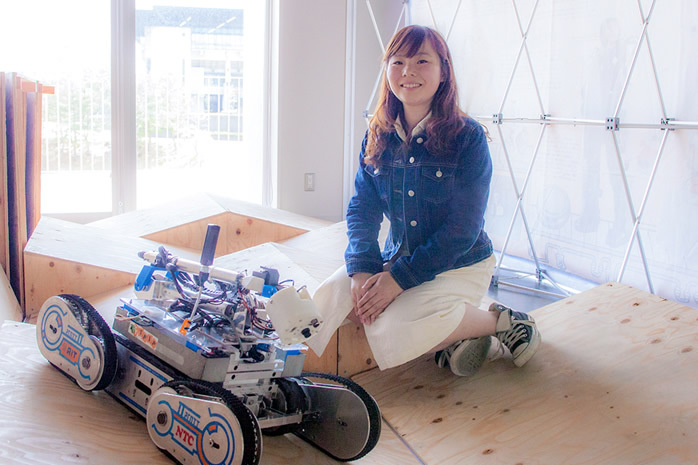 Due to changes in the regulations, the height of the KidSize robots is now from 40 cm to 90 cm. Although it’s still in the research stage, one of the robots from another team is nearly 90 cm tall. When I see it moving, I feel threatened (laughs). We’ll never let ourselves be defeated, and we’re now developing a robust, new-model robot with a considerably increased motor torque and durability. If it’s ready in time for this year’s competition, we hope we can introduce it. The progress in the AdultSize tournament is also remarkable. Two years ago, many robots were barely able to walk, but last year, they were able to walk more smoothly than before and were able to kick a ball. My teammates in charge of the AdultSize team were also surprised. Since I might be able to see further progress this year, I look forward to both the KidSize and the AdultSize tournaments. On the day of the interview, CIT Brains members in charge of the AdultSize team were also improving their robots.